Anderson DM, Gilbert PM, and Burkholder JM (2002) Harmful algal blooms and eutrophication: Nutrient sources, composition and consequences. Estuaries 25: 704 726. Boesch DF, Brinsfield R, and Magnien R (2001) Chesapeake Bay eutrophication: Scientific understanding, ecosystem restoration, and challenges for agriculture. Journal of Environmental Quality 30: 303 320. Carmichael WW (2001) Health effects of toxin producing cyanobacteria: 'The CyanoHABs'. Human and Ecological Risk Assessment 7(5): 1393 1407. Cloern JE (2001) Our evolving conceptual model of the coastal eutrophication problem. Marine Ecology Progress Series 210: 223 253. Hallegraeff GM (1993) A review of harmful algal blooms and their apparent global increase. Phycologia 32: 79 99. Landsberg JH (2002) The effects of harmful algal blooms on aquatic organisms. Reviews in Fisheries Science 10: 113 390. Lindeboom H (2002) The coastal zone: An ecosystem under pressure. In: Field JG, Hempel G, and Summerhayes C (eds.) Oceans 2020: Science, Trends, and the Challenge of Sustainability, pp. 51 86. Washington, DC: Island Press. Newton A, Icely JD, Falcao M, etal. (2003) Evaluation of eutrophication in the Ria Formosa coastal lagoon, Portugal. Continental Shelf Research 23: 1945 1961. Nixon SW (1995) Coastal marine eutrophication: A definition, social causes, and future concerns. Ophelia 41: 199 219. Nobre AM, Ferreira JG, Newton A, et al. (2005) Management of coastal eutrophication: Integration of field data, ecosystem scale simulations and screening models. Journal of Marine Systems 56: 375 390. 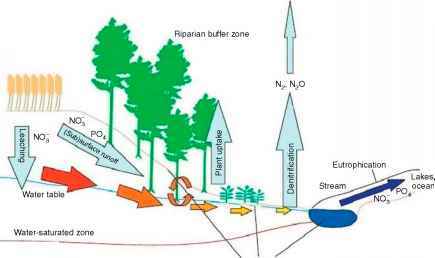 Rabalais NN (2002) Nitrogen in aquatic ecosystems. Ambio 31(2): 102 112. Rabalais NN (2004) Eutrophication. In: Robinson AR, McCarthy J, and Rothschild BJ (eds.) The Global Coastal Ocean: Multiscale Interdisciplinary Processes, The Sea, vol. 13, ch. 21, pp. 819 865. Cambridge: Harvard University Press. Rabalais NN, Turner RE, and Wiseman WJ, Jr. (2002) Hypoxia in the Gulf of Mexico, a.k.a. 'The dead zone'. Annual Review of Ecology and Systematics 33: 235 263. Sellner KG, Doucette GJ, and Kirkpatrick GJ (2003) Harmful algal blooms: Causes, impacts, and detection. Journal of Industrial Microbiology and Biotechnology 30: 383 406. Smayda T (1990) Novel and nuisance phytoplankton blooms in the sea: Evidence for a global epidemic. In: Graneli E, Sundstrom B, Edler L, and Anderson DM (eds.) Toxic Marine Phytoplankton, pp. 29 40. New York: Elsevier. Syvitski JPM, Harvey N, Wolanski E, et al. (2005) Dynamics of the coastal zone. In: Crossland CJ, Kremer HH, Lindeboom HJ, Marshall Crossland JI, and Le Tissier MDA (eds.) Coastal Fluxes in the Anthropocene, pp. 39 94. Berlin: Springer. Tett P, Gilpin L, Svendsen H, et al. (2003) Eutrophication and some European waters of restricted exchange. Continental Shelf Research 23: 1635 1671. Turner RE and Rabalais NN (1994) Coastal eutrophlcation near the Mississippi River delta. Nature 368: 619 621. Van Dolah FM (2000) Diversity of marine and freshwater algal toxins. In: Botana LM (ed.) Seafood and Freshwater Toxins: Pharmacology, Physiology, and Detection, pp. 19 43. New York: Dekker. Wolanski E (2001) Oceanographic Processes of Coral Reefs: Physical and Biological Links in the Great Barrier Reef. Boca Raton: CRC Press.